The new sofas are finally here! Mother Hand bought me a gorgeous Habitat sofa bed for my birthday at some point in my mid-teens. It was dusky red, gorgeously soft and ultra squishy. I couldn't take it with me when I moved out and it sadly ended up rotting in an alley near a place Sib was renting. Other than that tragic story, I've never had a brand new sofa that I've chosen before, and now we've got two! We bought our house from a slightly tragic man who had just split with his partner of 20 years, and he sold us essentially all the furniture for £1k. The old three piece suite came along with that. It was nearly new but that was 17 years ago and it was cream so, yeah. It was time that it went, though I did feel a big twinge of sadness when I came home last night to a big empty space. These are very lovely though. 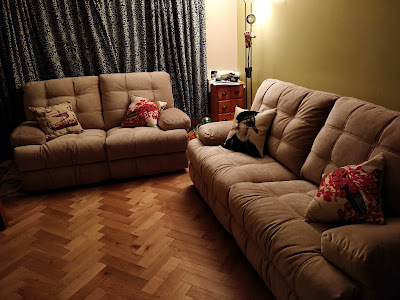 I was a bit worried that the generic beige we'd gone for wouldn't turn out to be very nice, since they only had a small sample square, but it works really well with the rest of the room. They've got electric footrests and they recline. The only problem is working out how to get them next to each other without the recliners clashing. Nicer problems to have. 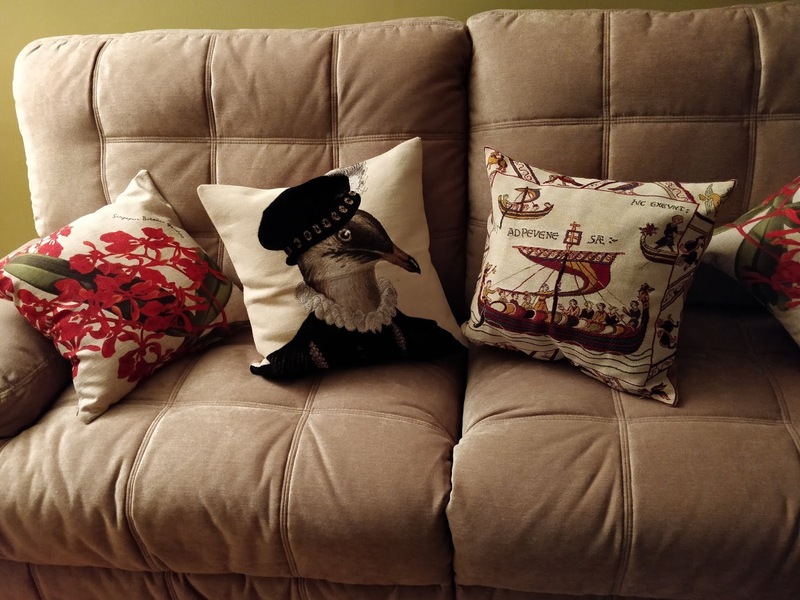 It also means I've been able to finally break out the little stash of cushion covers I've been collecting on various holidays. The florals are from Singapore Botanic Garden. The Bayeux Tapestry is from....well, Bayeux, right? Or it might have been Mont St Michel - somewhere in that vicinity. The weird bird in Tudor dress (Gondran, apparently) is from Carcassone. Those last two are both by the same French designer, Jules Pansu, and I considered them to be over-priced when I bought them (but I was on holiday so, meh) but now I see the Conrad Shop sells them for more than double what I paid, which makes me feel better. Now, just, HURRY UP CURTAINS.